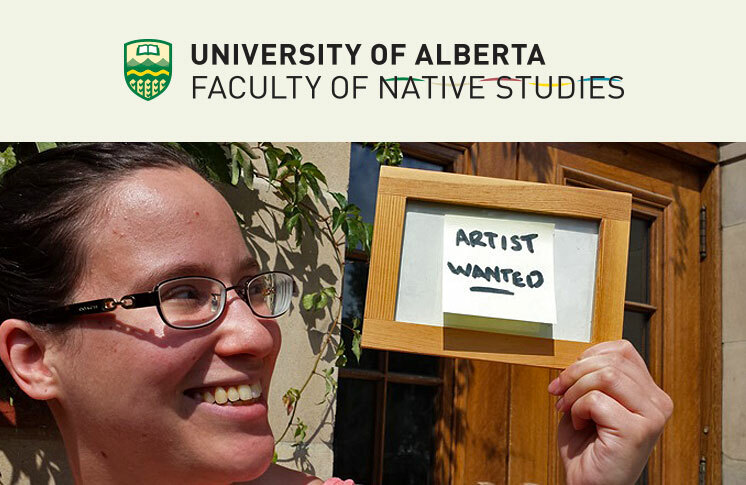 The Faculty of Native Studies at the University of Alberta is looking for an artist or group of Indigenous artists (First Nations, Métis or Inuit) to create a total of 4-6 original works to be purchased for use as backgrounds and associated merchandise for the massive online open course (MOOC) we are developing. These highly detailed illustrations (in the form of, but not limited to paintings, drawings, digital, or multimedia) will be used in two ways: first, they will be used as overall backgrounds for ‘green-screened’ video lecture presenters; second, the illustrations will contain smaller detailed scenes of historical periods to teach the course, Indigenous Canada. Simply put, imagine you are teacher in a classroom. The curriculum and stories are already provided, and your role is to create what will be put up on the walls to aid in the learning process. Each illustration will incorporate a scene that depicts several important ideas/facts/events all at once. For example, in one painting, three different lecture topics may be represented eg. Worldview, Fur Trade, and Treaties. One image may depict the signing of Treaty Six at Fort Pitt, a portrait of Big Bear, and the Treaty Six medal, while another could illustrate scenes of the fur trade, a beaver, Métis red river cart hunting scene, or trading parties, etc. A working knowledge and experience with Aboriginal Peoples and communities is an asset.